I had a very pleasant experience. The technician was on time and very polite and friendly. He said it was going to take about 3 hours for the set up but he was done in two. He explained everything well and I was pleased with the service from beginning to end. John B. was awesome! He worked quickly and showed me how easy the system is to use. We would recommend this company to anyone. Zach was very professional and knowledgeable about the security systems. He took time to explain what services he was performing, answered any questions I had and also took the time to show me how to access the new features through the Safetouch app before he left. Nick B. found the issue with our system quickly and replaced the bad part. He was very helpful as he showed me how to change the time on the system. (I was having trouble with the instructions previously provided). Mark G is an excellent Safetouch technician he know what needed to be done and he came in and took care of that . Thank you MarkG. Joel ** Was timely, professional, neat and thorough. Explained my system and any changes he had to make. Thank you Joel for all your help. ???????????? Joel was early and very knowledgeable with the system, quickly indentified the problem and my system was up in running in minimal time. Good job Joel... Bravo Zulu ! Anthony arrived on time and did his job as he should. He knew what to do. He was very personable and helpful.Had a good sense of humor.Well done Anthony!! very knowledgeable and efficient. arrived early and comepleted the worked in a timely manner. highly recommended. Joe was excellent. He took the time to explain the security system and how it works on our phone app. Joe was friendly, professional, and great at what he does - making customers happy. Joe gave excellent, outstanding sounds kind of corny, service and fixed everything for me. He checked the whole system and explained everything and as an electrical engineer I appreciated that. He set the clock back which nobody but safe touch knows how. Joe is a good man as is the whole staff. Lester could pick better hold music. Joe provided Awesome service today. Not was he on time, he was efficient, and provided excellent customer service. *** *. was very helpful, knowledgeable and thorough. He was courteous and was able to ID the problem quickly and to solve it efficiently. I appreciate his attention to satisfying all of our needs and insuring that all our concerns were answered. I highly recommend *** *. 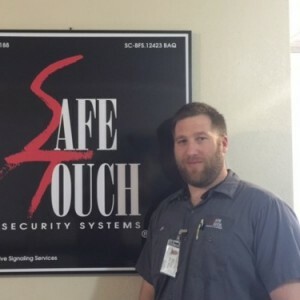 (Safe Touch Technician) to attend to any security system problem. Excellent and through service. The technician arrived promptly and communicated in a very professional manner in spite of a heavy work schedule. Thank you. *** was professional and corrected the problem right away. He performed a test to make sure the system worked before he left. the company gave me a two hour window for them to show up and *** was here within the first half hour of that time frame. A very competent and professional young man and the company is excellent. I would recommend this company to anyone looking for a security system. Extremely pleased with service. Response time excellent. Tech had ID badge visible, identified himself and had work order in hand. System was tested before he left and in good order. Pleasant & efficient. Joe did a great job of troubleshooting a couple issues we had, and showing us how to better use our security system. Tech that arrived was very professional. On 8 Sept 2016, I received outstanding service from Joe E; a professional, knowledgable and very experienced technician with a very good friendly personality. He quickly fixed my issues and also fixed a few additional ones that I remembered when he arrived. I strongly recomend this alarm system service with such outstanding staff. I was a satisfied customer for over four years with SafeTouch and would never consider anyone else. Joe serviced my system this morning and was fantastic. I had an issue with smoke residue in the alarm and he went the extra time to reinstall a new alarm unit. He was efficient, conscientious, and courteous. Safe Touch has a great technician in ***. Very professional and helpful. Would highly recommend. SafeTouch Security has serviced my account for 10 years plus and always responded timely to my requests. The quality of service is outstanding for maintenance of he system. The technicians such as *** *. are very knowledgeable and professional. Very satisfied with prompt service as well as courtesy and professionalism of personnel.